TOMORROW, we celebrate Pohela Boishakh, the first day of the first month of the Bengali calendar. The first day of Boishakh remains a holiday in Bangladesh. A festive mood grips the nation, as fairs or Boishakhee 'melas' pop up all over the place. People of all ages throng these melas to buy clothes, sweets, and handicrafts. Women attire themselves in white saris with red borders, and men don the traditional punjabi. As a designer, I believe that the spirit of Boishakh should be reflected in our homes and lifestyles through the décor of our dwelling places. The stairway is the part of the house that plays a key role. The house shown in these pictures is about 24 years old. The entire building is very simple, clean and cosy. Bengal is rich in items that could be used in home décor. Plants are vital. A tropical climate like ours enables us to grow plants anywhere, in pots that can be kept out in the terrace, on the roof, and just about any corner of the house. In these pictures, potted money plants have been placed on the stairs. These plants grow quickly with sufficient water and sunlight. To ensure adequate supply of sunlight, the roof door can be kept open during the day. Long stair windows can also provide entry points for sunlight. 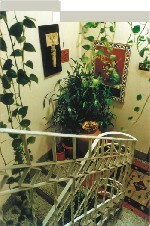 Plum, ficus, rubber plant, and various ferns have been placed at the stairs. 'Potochitra' is a very rich and very beautiful folk art of Bengal, and Shambhu Acharia is a legendary artist who works with this. A long potochitra has been placed in a narrow place for welcoming guests. Bamboo can be used for interior decoration as well. You might see 'Muli baash' growing by the road on the way to Chittagong. Some of these muli baash have been placed amidst the potted greenery on the landing shown in the photos. They create a pleasant effect. It is easy to find bamboo artwork locally, as well as masks made of palm bark. These are usually made by illiterate people, and are not very expensive. As I mentioned before, Pohela Boishakh is a great festival for us Bengalis. An air of festivity sweeps over the entire nation. On this day, a vast rally takes place, which is an integral part of our culture. This rally is unique because it features paper maché masks in the shapes of horses, elephants, etc. These are made by students of the Fine Arts Institute, worn in the rally, and sold afterwards to cover the expenses borne during the occasion. So these are easily available, and you can use them to decorate your home. If you are fortunate enough, you might even come across masks made by eminent artists like Shishir Bhattacharya, Kazi Rakib, Masuda Kazi, Nazlee, and so on, as they often contribute to the rally. These pictures also show a baboi's nest, brought from the village, and arranged on the walls to create a nostalgic and romantic feeling. Thus we can easily use natural and local materials to decorate our homes and offices. Bamboo, cane, palmyra, coconut palm, reeds, bark, and grass are all eco-friendly items. Altogether, the photos represent an effort to create a welcoming atmosphere, keeping alive a long-standing tradition by using items so that even a neglected staircase can transform into a beautiful space.